A two-level high-intermediate/advanced course, Summit is the perfect next step for learners who have completed a beginning to intermediate-level course. Top Notch (with Summit) is an award-winning best-selling six-level communicative course for adults and young adults. The course begins at absolute beginner level and ends at an advanced level. 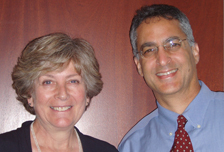 Find out more about co-authors Joan Saslow and Allen Ascher. You can also read their interview with former ELT News editor Mark McBennett. To download an audio file, right-click on the audio icon or "Download audio" link and select "Save Link As" or "Save Target As"
The purpose of the Pronunciator is to remove doubts about the pronunciation of any proper nouns that appear in the Summit Student’s Books but that are not heard on the Class Audio Program; for example, names of people or places that appear in grammar exercises or illustrative material. For each word, the Pronunciator provides both the audio of the pronunciation and the phonetic transcription. Extra Reading Comprehension Activities from Summit CD-ROM 1.